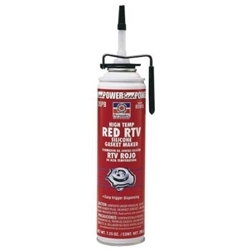 Formulated for hi-temp applications, or heavy-duty use (such as towing, etc.). Replaces almost any cut gasket by making reliable “formed-in-place” gaskets that resist cracking, shrinking and migrating caused by thermal cycling. Coats pre-cut gaskets to increase reliability. Temperaturerange -65?F to 650?F (-54°C to 343°C) intermittent; resists auto and shop fluids.